Every First Saturday of the Month, pro-life religious, clergy and laypeople gather on the streets of New York City to be witnesses for the pro-life movement. Some of the religious orders included the Sisters of Life, the Franciscan Friars of the Renewal, and the Franciscan Sisters of the Renewal. “Witness for Life,” a monthly event held in New York City, gives pro-lifers the opportunity to peacefully and publically pray for an end to abortion. They recently held their 10th Anniversary event on Oct. 6. The event begins with Mass at the The Basilica of St. Patrick’s Old Cathedral, followed by Exposition of the Blessed Sacrament. 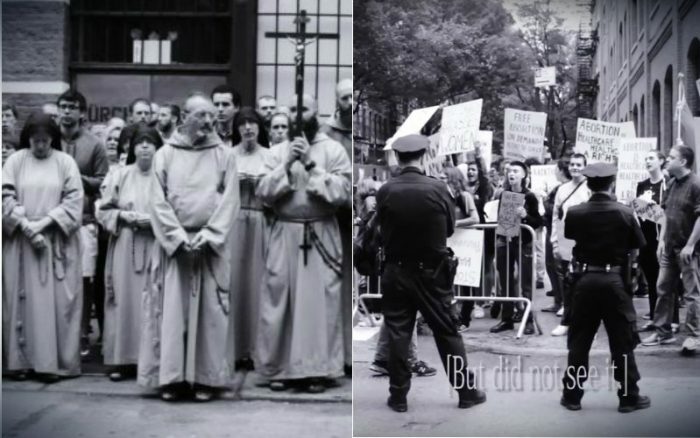 They then lead rosary procession to the Margaret Sanger Center Planned Parenthood in Manhattan. The walk concludes with Benediction of the Blessed Sacrament at the cathedral, followed by a social. However, their peaceful processession isn’t alway peaceful. Our Lady of Guadalupe, please pray for and protect the unborn!